bearing Oyster Bay scenes extending back to the 1890s. Early 20th century postal regulations allowed only an address on the card’s verso side. Messages were relegated to a small blank panel below or to the side of the card’s image. Messages were necessarily brief, but correspondents still managed to squeeze a thought into the space allowed them by the United States Postal Code. St. Dominic’s Church. Oyster Bay, L. I. New York : Illustrated Post Card Company, 1905. 89 mm x 139 mm. Some publishers recognized the potential popularity of postcards as bearers of both news and images and provided more space for the message. A Sylvan Scene / Oyster Bay / L.I. ca.1898-1905. 89 mm x 139 mm. By 1907, senders were at last authorized to include a message on the card’s back, to the left of the address panel, leaving the image side free of scrawls. A flap cut into this pretty chromolithograph of sightseers can be lifted in order to allow a handful of tiny printed scenes from Oyster Bay to spill out. Germany was a major printer of postcards for the American market before the First World War. Sight Seeing Automobile / Oyster Bay, L.I. Germany, 1907. 89 mm x 139 mm. Photographic postcards represented another special format. Here, a photographic emulsion is laid down directly onto a card stock in order to commemorate a specific occasion, in this case July 4, 1916. Col. Theo. Roosevelt addressing Residents and Friends at Oyster Bay, L.I. 1916. 89 mm x 137 mm. Leather cards, produced commercially or by home kit, were a popular novelty. Images were burned as blind designs or, less commonly, with color applied, and often featured stock illustration, scalloped edge decoration and appalling doggerel. Theodore Roosevelt and other presidents appeared in non-presidential settings. Oysters R in Season. 1906. 89 mm x 137 mm. In the 19th century, elaborately decorated commercial trade cards passed hand-to-hand through the market. This 1923 post card represents a simpler, more direct advertising strategy, allowing for quick and relatively cheap dissemination through the mails. ca. 1923. 83 mm x 139 mm. 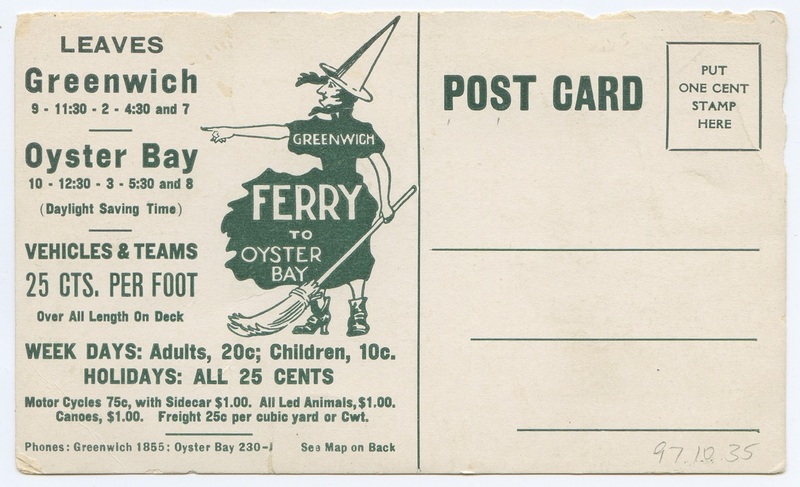 Advertising by postcard was particularly suited for the cross-sound ferry services and their tourist trade in the first decades of the twentieth century. 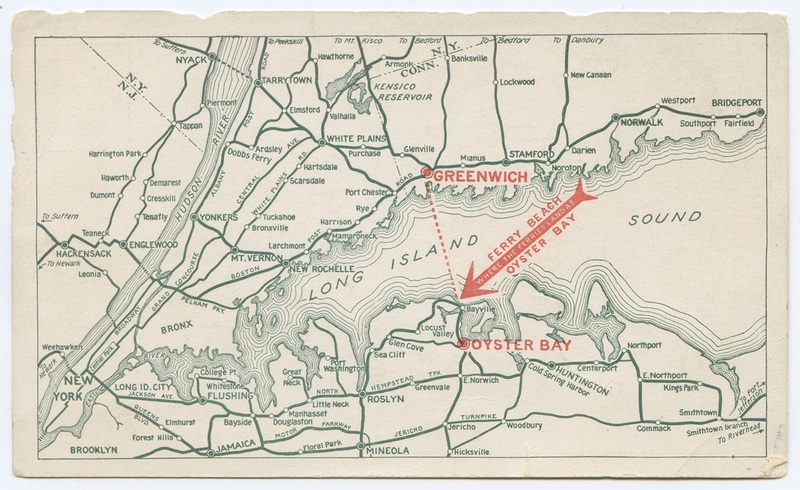 The Greenwich—Oyster Bay service, active from 1917 to 1930, actually operated from Edgar Adams’ Ferry Beach in Bayville, as the card’s map indicates. The line at its height of popularity featured hourly service, while accommodating not just passengers, but “led animals” and canoes. The Society’s Summers Postcard Collection includes many tourist cards published by the Eagle Post Card Company of New York City, known for predictably picturesque scenes of sea and shore from New England and Middle Atlantic States. This 1930s view features the Bayville Aquatic Club, whose swimmers were highly successful in competitions of the day. 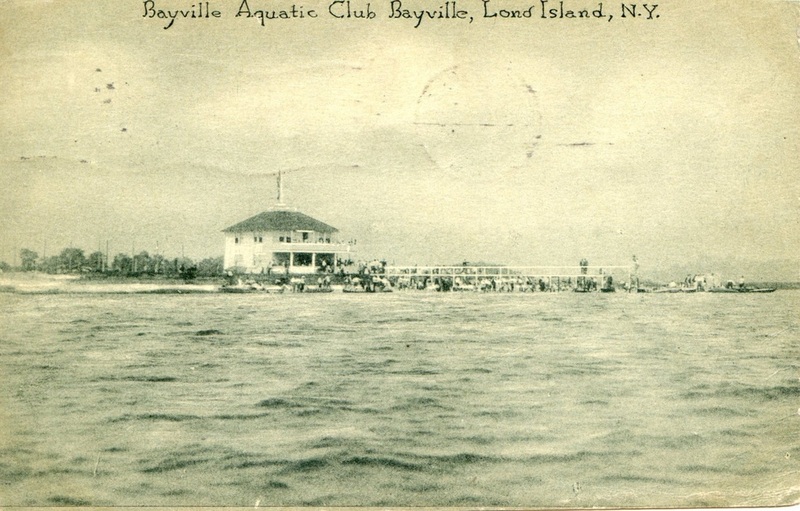 Bayville Aquatic Club, Bayville, Long Island, N.Y., ca. 1930. 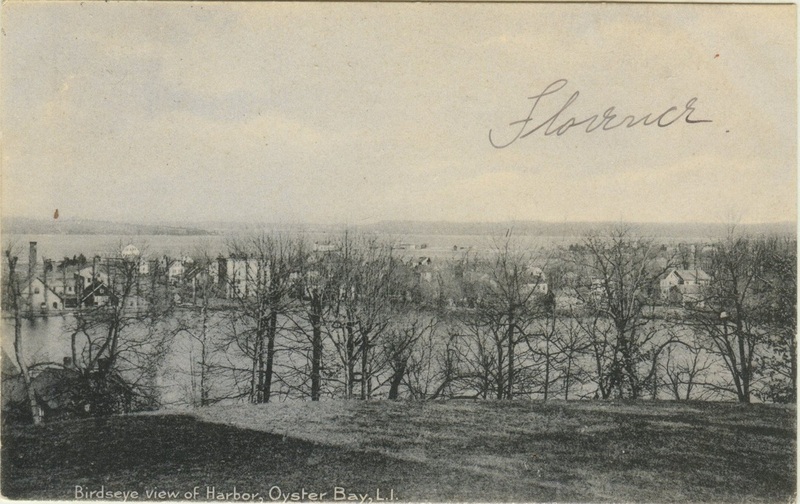 Oyster Bay retailers like Groebl Brothers Music Store and Snouder’s Corner Drug Store sold post cards of local scenes, although the cards themselves were usually produced in Leipzig, Dresden, Frankfurt, and other German printing centers. Distribution of German cards in particular, and German products generally, stopped abruptly with the onset of the First World War. Birdseye view of Harbor, Oyster Bay, L.I. ca. 1900.